The speed sensor detects the wheel speed and sends the appropriate signals to the skid control ECU. The skid control ECU converts these wheel speed signals into a 4-pulse signal and outputs it to the ECM via the combination meter. The ECM determines the vehicle speed based on the frequency of these pulse signals. 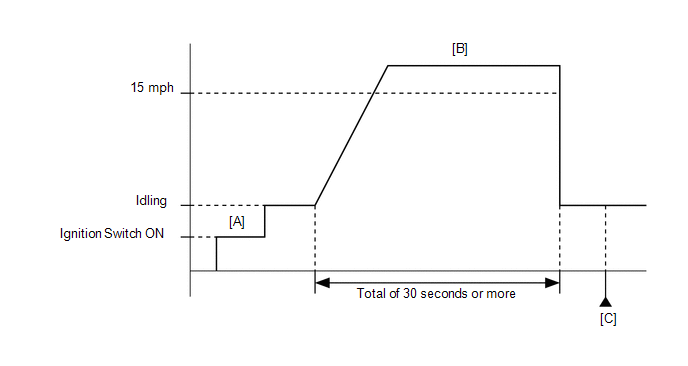 If there is no speed signal from the combination meter assembly even though the ECM determines that the vehicle is being driven, the ECM interprets this as a malfunction in the speed signal circuit. The ECM then illuminates the MIL and stores the DTC. Drive the vehicle at 24 km/h (15 mph) or more for a total of 30 seconds or more [B]. 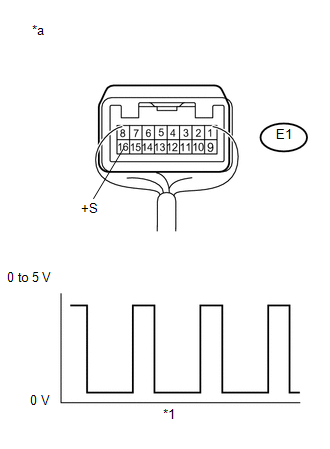 (a) Drive the vehicle and check whether the operation of the speedometer in the combination meter assembly is normal. The vehicle speed sensor is operating normally if the speedometer reading is normal. If the speedometer does not operate, check it by following the procedure described for a speedometer malfunction. (e) Enter the following menus: Powertrain / Engine / Data List / Vehicle Speed. Vehicle speeds displayed on the Techstream and speedometer display are equal. 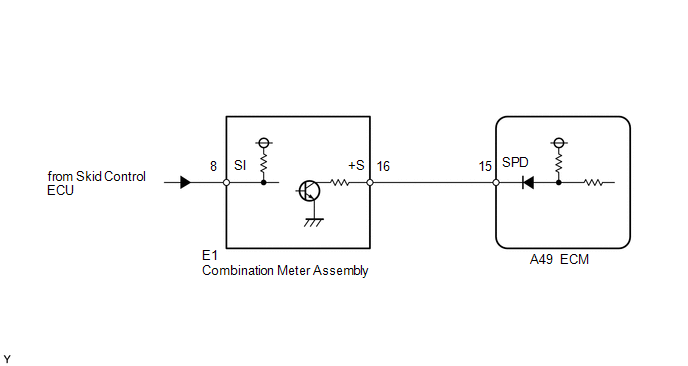 (a) Inspect the combination meter assembly using an oscilloscope. (1) Jack up the vehicle. (4) Measure the voltage between the terminal of the combination meter assembly and the body ground while the wheel is turned slowly. The output voltage should fluctuate up and down, similarly to the diagram, when the wheel is turned slowly.